Adaptive Recreation Annual Meeting | DREAM Adaptive, Inc.
Julie joined the DREAM Adaptive team as the program coordinator in January 2017 and moved into the Executive Director role in June 2018. She grew up near balmy Buffalo, New York as a four-season fresh air kid. She was a two-sport and All-American athlete in college, earning a B.S. in Psychology and M.S. in Sports Administration. 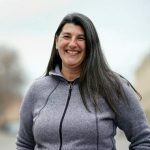 Julie made her way west to Colorado and worked for the US Olympic Committee for over five years, coordinating camps and events at the Colorado Olympic Training Center and also for US Paralympics. Highlights of her tenure included supporting the 2010 Winter Paralympics in Vancouver and the 2012 Summer Olympics in London. 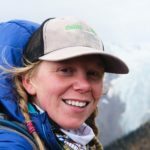 Her free time was spent exploring the Rockies where she honed her snowboarding and mountain biking skills and fell in love with mountain life. Before moving with her husband and pup to Whitefish in December of 2016, they lived the salt life for 4 years in southern California. Throughout her traveled career path, Julie has always made it a priority to volunteer and work with adaptive sports programs in her local area. A true New Englander! Andrea was born and raised in Maine and graduated from the University of Vermont with a degree in Public Health and Spanish. She served in the Peace Corps in Peru where she was the highest volunteer in the world — above 13,000 feet! After traveling around South and Central America, Andrea wanted to see if the west really was the best. She moved to Whitefish, Montana at the end of summer 2016 after a friend told her he lived 35 miles from Glacier National Park. Since then it’s been a dream come true. She enjoys ‘getting after it!’ Whether it’s skiing, running, biking, scuba diving or her favorite, bagging peaks, Andrea does it all. In 20016/17 she worked for Whitefish Mountain Resort in the base lodge, where she discovered the DREAM team. She immediately knew that she wanted to be a part of the organization. Andrea feels incredibly lucky to spend everyday outdoors working with the local school groups and athletes in the valley. Lucas has been shredding a skateboard or snowboard since he was born! In 2000 he organized the first adaptive snowboard freestyle camps and national competition in the world with USASA. He was a Paralympic hopeful in 2014 for the Sochi Winter Games before an injury sidelined him. He now runs a successful business in Whitefish and coordinates the Dream Backcountry Powder Camp – one of only a few cat assisted backcountry programs for adaptive athletes in the world!